We are a local non-profit organization recently certified by the Internal Revenue Service as a 501(c)(3) charitable organization” which is dedicated to the preservation of access to old highways, rangeways and trails in the Piscataquog River watershed area. 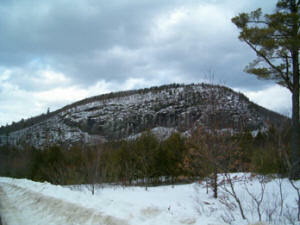 Members ride and drive horses, hike, cross-country ski, bicycle and snowshoe. We work with local conservation and forestry committees, private landowners, planning boards and developers to facilitate keeping trails open. Trails that need maintenance are scheduled for work. New trails are planned and cleared. Walks and rides are open to the public to encourage residents to learn more about recreational trails and the value of open land in their towns. In this way, members share their knowledge of local trails with others. We also sponsor fund raising events to raise money for large projects. Our membership dues are low because our members biggest contribution is a willingness to contribute their time, skills and labor towards the fulfillment of our goals. Trail maintenance is an important part of this contribution that everyone can participate in. 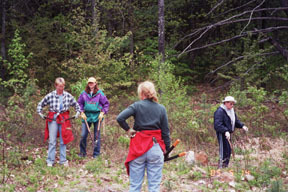 Active members usually volunteer at least six hours per year on trail work. A typical workday is a morning event from 9:00 to 12:00. The work consists of trimming branches and picking up dead wood and debris. Members receive instruction in the correct way to do this. Most of the heavy chain saw work is done before the workday. There is something for everyone to do on workdays; the whole family is welcome!